George Billis Gallery Los Angeles is proud to announce a solo show of Carol Inez Charney’s newest photographs. This body of work, referred to as Interior Landscapes, is a photographic series that uses natural distortions present in our every day world – namely, moisture and ice crystals on windows— to evoke a painterly image that re-contextualizes our everyday architectural landscape. With this as her starting point, Charney photographs contemporary architecture and distills it down to a series of compositional planes, which become the basis of the final image. 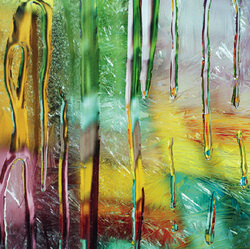 This composition is then obscured by placing it behind a sheet of glass that has been painted with water, thus combining painterly abstraction and photographic realism to create her own visual vocabulary of abstracted photography. Ranging in size from 30 x 30 inches to large scale 48 x 48 inches, these vibrantly hued images are painterly and ethereal.